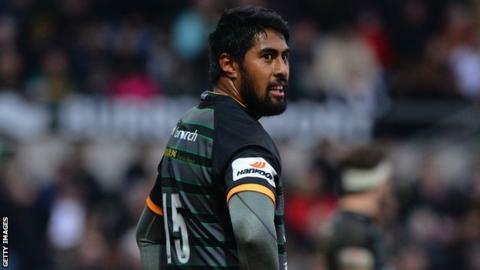 Northampton Saints full-back Ahsee Tuala said he needed to lose weight in the summer to improve his fitness. The Samoa international, 26, moved to Franklin's Gardens in February. "It's a new year, new start. I wanted to come back in good nick in the off-season. I shed about 8kg before I left and then (2kg) when I went on tour with Samoa," he told BBC Radio Northampton. "I had to put a little bit more beef back on just so I'm not too light and don't get chucked around." Tuala has made 10 appearances for Jim Mallinder's side since joining last season as cover for an injured Ben Foden and signed a new contract in the summer. He added: "I feel good at the moment, I'm just keen on getting more game time. "It was mostly in the gym - on my days off I'd just go in and do a bit of work, working really hard to improve my game so I'm a lot fitter in the field." Tuala also paid tribute to the contribution New Zealand great Jonah Lomu, who died at the age of 40 this week, had on players from his part of the world. "He's changed the game for us Polynesian boys especially, coming from the Pacific Islands and also from South Auckland, a counties region I played for back home, he was part of as well and a massive influence. "It's tragic that we lost him and thoughts and prayers go out to his family."